The eclecticist New Palace is one of the most magnificent examples of the architectural heritage left by Ernst Ziller. Its history began right after the birth of Crown Prince Constantine in 1868, when the Government decided to grant the Heir to the Throne a private residence upon his majority. To this end, a 3.7-hectare lot was ceded that included the present Presidential Mansion as well as part of the National Gardens. In 1888, at the period of Constantine’s engagement to Princess Sophia of Prussia, the design for the Crown Prince’s palace was assigned to the famous Saxon architect Ernst Ziller (1837-1923). It was completed in 1890. Construction works on the initial building began in 1891 and were finished in 1897. Ziller’s designs for the building were an application of the simplified style of the unexecuted design of Theophilus von Hansen for a summer Palace. It was laid out in the nature of a private mansion. On plan, the initial building was rectangular. The areas are laid out around the main hall and the central staircase, which is two storeys high, is lighted from the upper floor and surrounded by an Ionic colonnade on the ground floor and a Corinthian one on the upper floor. The building consists of a basement, ground floor and two upper floors. The façade is tripartite, with emphasis laid on the lateral wings that project out from the main body of the building. The axis is emphasised by the entrance porch that has four Ionic columns and a balcony on the first floor. Vertically, the building is divided into base, trunk which are the ground and first floor and crown which includes the second floor and the parapet. The crown has special weight with the frieze exceeding the usual dimensions under the cornice, obviously to create a satisfactory surface for lighting the last floor, and consists of the alternation of double openings and relief parapets. According to Ziller’s original plans, statues were to be placed on the corner piers of the parapet, at the ends of the lateral wings. The trunk is interrupted by a horizontal cymatoid cornice on the floor levels while the corners of the building are treated with rustic cornerstones. The space between the openings and cornices is covered by textured plaster. And finally the base consists of dressed marble on the façade, which extends partially along the sides, and the rest is bossed false stone. After the Old Palace was destroyed by fire, the royal family moved to the Crown Prince’s palace which then became known as the "New Palace". At that time, the initial building was enlarged by the addition of a ballroom. It can be seen from Ziller’s original plans that as early as 1892, various proposals were made for an addition, which was designed in 1909 and carried out in 1910. One of the solutions proposed is that which was finally implemented with the participation of architect Anastasis Metaxas. The addition presents a stylistic deviation from the eclecticism of the initial building, with visible influences from more severe neoclassical models. It is a single-storey wing extending the old building northward. The façade of the addition has a triple opening with Ionic columns crowned with a pediment. The addition and the main building are connected by means of a set-back wing featuring a row of lengthwise openings supported on piers. It was proposed that dome over the ballroom be constructed of sheets of pre-oxidised copper. From 1909 to 1924 (24 March), when the kingdom was abolished and a republic was proclaimed in Greece, the New Palace was the residence of the royal family. During the period of the Republic, the building was used as Government headquarters and to accommodate presidents of the Republic. In 1935, with the restoration of the monarchy (George II), the building resumed its initial use. In 1964, in view of the wedding of the then King Constantine, the building was extended to include a large hall. The plans for the extension were drawn up by civil engineer Alexandros Baltatzi, architect Maria Dimitriadou-Loukakou and set designer Cleovoulos Klonis. That extension included the construction of a gate on Meleagrou St as well as the landscaping of the entrance on Vas. Georgiou St. The 1964 addition, which was built under great pressure in terms of time, attempted unsuccessfully to imitate the initial building. But it not differentiated in terms of either style or volume and even falls short of its initial aim, as the main throne room lacks any morphological or plastic interest. The addition was built along Vas. Georgiou St to the corner with Meleagrou St, after the demolition of the larger part of an auxiliary structure. The use of the building as the residence of the royal family continued until the unsuccessful royal counter-coup in 1967. 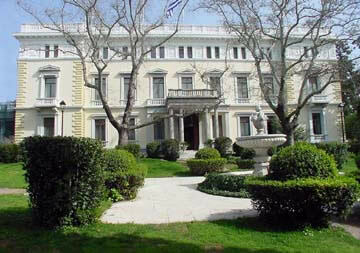 Since Greece’s return to democracy in 1974, it has been used as the Presidential Mansion. Various internal alterations have taken place since 1967. The most recent repair and conservation was conducted in 2002 by the architectural offices of Takis Gavrilis and Mikhail Tylianakis with G. Papageorgiou in charge of technical matters.